Home > Driving > What Are You Allowed To Do If An Emergency Vehicle Is Approaching? 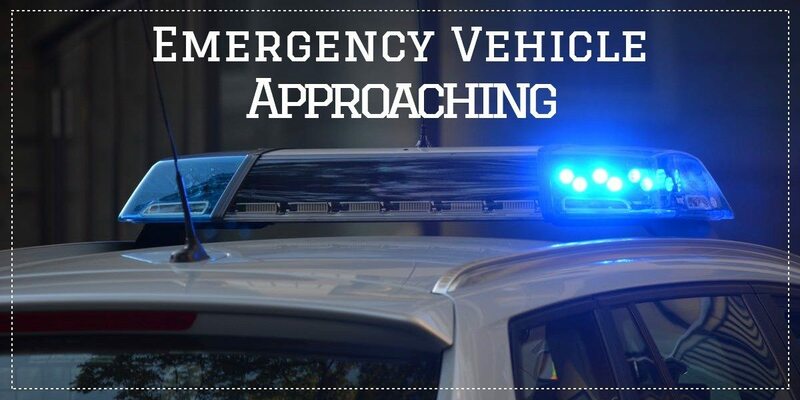 Seeing an emergency vehicle approaching can make any learner driver feel as if they’ve been thrown into a very pressurised and worrying situation. Ultimately, it shouldn’t be either. Dealing with the onset of an emergency vehicle – whether it’s a police car, fire engine or ambulance – requires merely sticking to the law, remaining calm and following the correct driving procedures. Firstly, it’s important to remember that you are still responsible for whatever actions you take on the road, regardless of whether an emergency vehicle is approaching or not. This means that you can still be penalised for breaking the law in ways that would be unacceptable in all circumstances. For instance, if you drive through a red light in order to let an emergency vehicle pass, then you could be fined for the offence regardless. However, it is worth mentioning that if a uniformed officer beckons you to do this then follow their orders. The same rules apply when it comes to entering bus lanes and travelling along solid white line roads, among other situations. When it comes to solid white line roads in particular, make sure you only pull over when you are past the white line area. Whatever the situation, remember to stick to the speed limits that apply as breaking them would not only break the law but also risk putting others in danger around you – including the emergency vehicle themselves. In order to ensure you stay legal and safe under these circumstances, there are some good habits to get into and tips to bear in mind. Keeping your ears pricked for the sound of emergency vehicles is useful, as you will often hear them before you see them and as such, have more time to react safely. It is also worth remembering that even if you hear an emergency vehicle, that doesn’t mean it’s going to pass by you – it could be travelling on the opposite side of the road, turning at a junction behind you or otherwise. Therefore, make sure you locate where the noise is coming from and keep an eye on its indicators. And finally, don’t forget to go through basic driving practices such as indicating and checking your mirrors when pulling over to let the vehicle passed. The last thing you want to do is knock over a cyclist and create a second emergency for them to attend. Follow these general rules and you’ll find that you’ll be able to deal with the situation as and when it comes in a calm and legal manner.